excel or word file after a long time struggling. 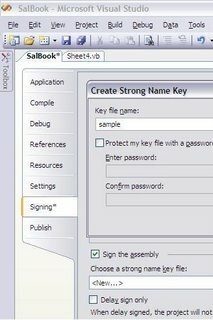 Though there are many ways to deploy VSTO solution for a document level and most handy one i have found so far has been - signing the assembly with a strong name then add entry in the .NET 2.0 security configuration. This is most handy because if you use URL then you cant shift the location of the folder which i needed in my case. Here are the steps. 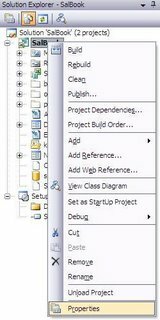 1) First open your VSTO solution project and open project properties and then go to signing. 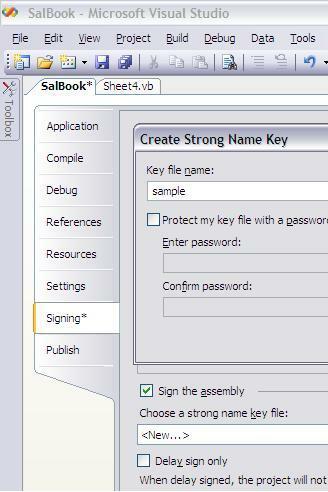 Then give sign the assembly and key file name choose new. Enter a file name in the dialog box and set password if you need it. then save the project and rebuild it again. 4) Right click and create new and enter a name click next and then select condition type to Strong Name. 5) Click import below and select the required assembly and check the name and version boxes and give next, provide Fulltrust and then finish. Now the assembly is ready to run on developers computer anywhere. But you cant follow all the above steps in the endusers computer because you just can't expect every end user to have VS SDK installed. So the Microsoft .NET Framework 2.0 Configuration console doesnt appear. I had read in many places about caspol.exe tool and tried it but may be i was doing something wrong, and i just couldn't get it working. so the easiest way is this. to save the MSI file and finish it. Now this msi file can be used to automatically follow the steps 2-5 in the endusers computer. hi raj how to contact u yar. .
and one more u know how edit existing pdf file. . .